Genetic Savings & Clone can fix you up with a clone of your cat for just $50,000. Better hurry; work starts in May, with the first kitty klones available in November if all goes well. Texas A&M University, in Operation CopyCat, produced Cc (shown above). "Cc" is short for "carbon copy." As an historical footnote, "carbon copy" refers to the placement of alternating layers of regular paper and thin sheets of a special paper with carbon particles heavily distributed on one side. When rolled into a typewriter, and struck with a typewriter key, the imprint of the key would be seen not just on the top piece of paper, but through the alternating sheets as well. This resulted in a set of as many as five "carbon copies." CEO Lou Hawthorne says "There are people out there who use the statement that cloning is reproduction not resurrection. But the interesting part from the genetic perspective is that this is resurrection." 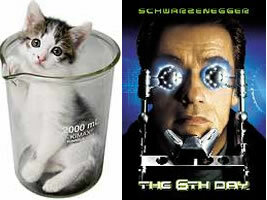 Science fiction fans of course remember that Governor Arnold Schwarzenegger had a cloned dog in The Sixth Day. Fans of sf author Frank Herbert recall Duncan Idaho, whose ghola reappeared through an entire series of books. See Copy cats now possible for more information.